For this edition of Playing Inside, we visited Crescendo Studio. We thought it would be a little difficult finding a venue that not only provides high-quality musical instruction, but also does so in a very conducive and trilingual (English, French, and Chinese) learning environment. But that’s exactly what we found at Crescendo! We went there primarily to check out a family-friendly concert that they had organized by the American folk duo, Kirk Kenney and Parker Trevathan. An hour watching these two guys picking and grinning their way through a range of classic kid songs put us in a great mood, and also gave us a pretty clear idea of what this music school is all about: making music learning fun! This is an aspect of music training that is sadly neglected for many youths picking up an instrument for the first time. Crescendo was founded by husband and wife team, Nico Toresse and Zoe Wang because they noticed that there weren’t many music schools in town that were focusing as much on enjoying musical education as they were on the technical skills needed to excel. After all, China is known for producing young musicians that can belt out note for note of complex compositions written by legendary composers. 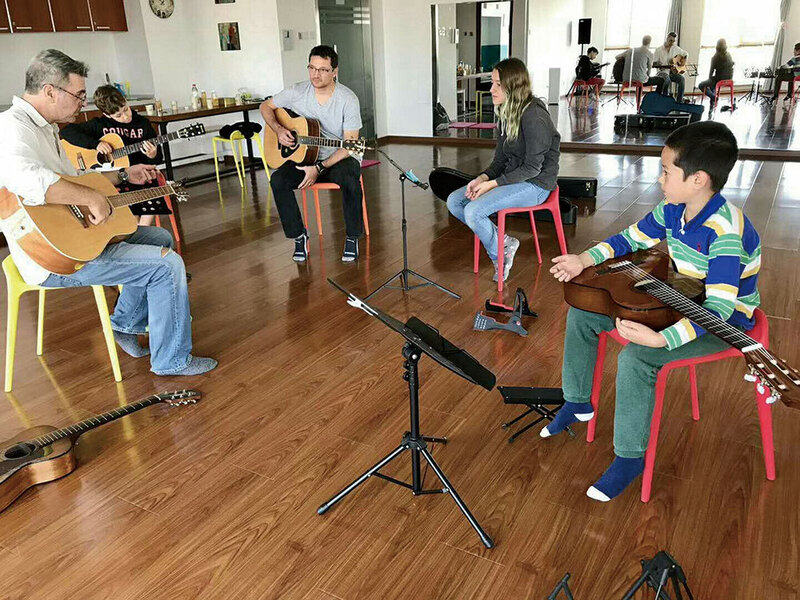 Before they opened up their brand new shiny music school in Liangmaqiao last October, they were traveling all over the city giving lessons for guitar, accordion, and music theory. Now they’ve rounded out their course offerings with classes in musical exploration, percussion, piano, dance, and much more. When asked at what age is the most appropriate time for a student to begin learning an instrument, Nico quickly responded that he didn’t see the point of putting a four-year-old in front of a piano. 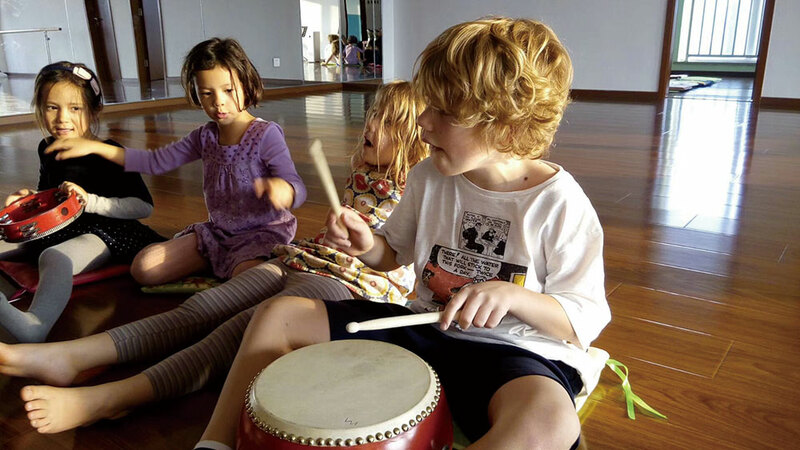 That’s why, starting with four-year-olds, Crescendo has implemented their own unique musical exploration class that helps students gain a solid foundation in music. In this course, students begin by using their voices as their first instrument. Following this, students are encouraged to take music theory classes where they will start writing and reading music. While students have the option of learning an instrument at any time, we agree with their view that developing an interest and love for music should be what comes first. We were also happy to learn that during classes, teachers don’t shy away from also using videos to also teach other forms of musical knowledge. The historical context of a song or style of music is another aspect that is ignored in musical training, and we believe it allows for a more thorough approach to learning. This made us extremely jealous, compared to our own music lessons as kids, when we only had a boom box with scratched CDs that we could inconveniently learn from. As we were leaving Crescendo Studio, we witnessed the excitement of one of their students receiving his first guitar. He was getting some brief instructions from Nico on how to take care of this magical instrument, and you could see the glow in his eyes as he was putting it away in his gig bag to take home. We could tell this would be a day that this young guitarist would likely never forget. Currently, Crescendo is developing a comprehensive list of classes for summer. This is great for those of you out there that want some intensive music training to fill up the copious amount of free time that is about to land on your child’s lap in just a couple weeks. For more details regarding pricing, and group or one-on-one classes, follow the Crescendo Studio account on WeChat (WeChat ID: Crescendo-Studio). Sun and Fun: “At the Beach” Family Day, Women’s Quiz Night, and More!